This radiant bouquet is beautiful and complex, just like the season itself. 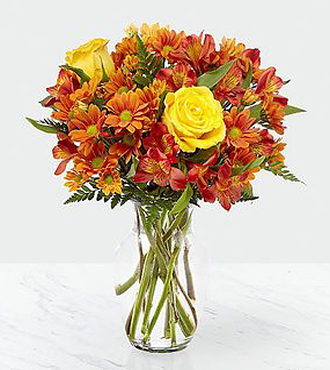 Made up of yellow roses, bronze daisy pompons, and red alstroemeria, set in a clear glass vase, the Golden Autumn bouquet truly brings out the best of fall. STANDARD bouquet is approx. 14H x 12W. DELUXE bouquet is approx. 16H x 13W. PREMIUM bouquet is approx. 17H x 15W.